Today VMware and Salesforce.com announced vmforce.com finally after several weeks of speculations on what the joint project is about. The following diagram I captured from the live webcast of the event answered the question nicely. The event attracted about 3,500 online viewers, not to mention the audience onsite. This was a very successful event, resulted in more media coverage than anyone can read. If you missed the live webcast, you can check out the recorded one from the website. Among all the blogs and news coverage, I think you should read the one by Steve Herrod who has done a great job in explaining the joint adventure in a big picture. His blog also has links to other bloggers. The mission first appeared in a blog on SpringSource acquisition. With this in mind, all the acquisitions made by VMware starts to make great sense. It’s mentioned several times in the keynotes on this shared mission with saleforce.com. The VMForce is part of the cloud story for that mission. VMware’s entries into this space will focus on addressing this challenge and, with our partners, creating “Open PaaS” offerings. This is a great news for the developers who can develop once and deploy anywhere without worries about vendor lock in. VMware is building a product portfolio for cloud platform though a series of acquisition of SpringSource, RabbitMQ. These products, along with others that we’ll unveil in the near future, are what we refer to as “vCloud Developer Services” and “vCloud Platform Services”. 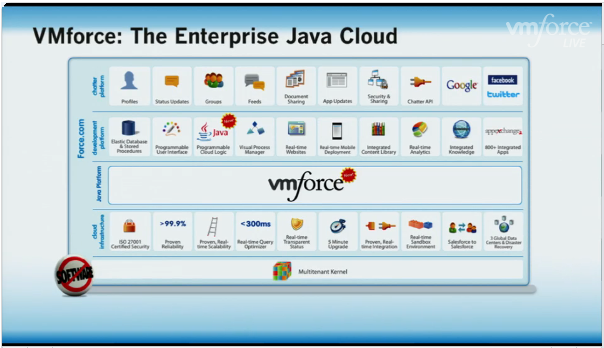 The VMforce collaboration is VMware’s first public implementation of Platform-as-a-Service (abbreviated as “PaaS”). VMware’s PaaS strategy is through collaboration with others. With vmforce being the first, we can reasonably assume more to come in the future. Ready to try vmforce.com? You can sign up the developer preview coming this fall from the website. What Does DevOps Mean for Cloud Professionals? What The CTO Wants YOU to Know?